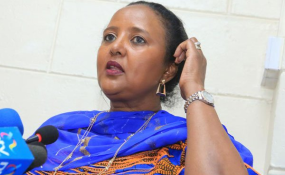 Foreign Affairs Cabinet Secretary Amina Mohamed has urged the US to help Kenya improve its economic and security situation, arguing that it will be in the interest of both nations. In a series of meetings with top US officials last week, Ms Mohamed said that President Donald Trump's 'America-first' policy can still be achieved with increased trade between Washington and Nairobi. "Kenya values the longstanding partnership and cooperation with United States and is keen to explore new avenues and possibilities of strengthening the relationship as the new 'America first policy' takes shape and crystalises," she said in Washington. Ms Mohamed added that the US should encourage more firms to set up shop in Kenya because "ours is one of the promising emerging markets with vast opportunities". The two countries are also cooperating in the fight against violent extremism. It was her first trip to Washington since President Trump came to power in January. In a bid to influence voters, Mr Trump promised to safeguard American interests in what came to be known as 'America First'. It was a slogan that got some allies in the region worried that the new President could stop further bilateral assistance and trade openings, which have traditionally been through the African Growth Opportunity Act (Agoa). Ms Mohamed met with Senator Bob Corker, the Chairman of the US Senate Committee on Foreign Relations; Mr Tom Shannon, the Acting Deputy Secretary of State and Deputy Assistant U.S. Trade Representative for Africa, Ms Constance Hamilton. She also met with Ms Florizelle Liser, the President and CEO of the Corporate Council on Africa, an American business association focused solely on connecting business interests in Africa. While the talks centered on plans for the upcoming US-African Business Summit due in Washington in June, Trump's policy was the influence and whether it could alter the existing relations. Kenya's trade with the US was worth $1.5 billion in 2015, importing $937 million and exporting $565 million, according to the US Department of Commerce, leaving an imbalance of $371 million. The US argued its exports to Kenya supported about 8,000 jobs directly as Kenyans bought aircraft, machinery, cereals and other spare parts. Kenya, through Agoa, exported textile products, coffee and tea and fruits and vegetables. "Kenya shares the United States security concerns in the Horn of Africa including fighting violent extremism, stabilising Somalia and concluding the South Sudan peace process. "Kenya is open to discussions on the new Administration's ideas on how to push forward this shared agenda," she said, according to a dispatch from the Foreign Ministry on Friday. "We welcome America's support in Somalia and affirm the absolute necessity of fighting terrorism and ensuring that extremist groups do not obtain a foothold in the Horn of Africa region," the CS added. Her trip came after the US designated parts of Somalia as a war zone, allowing US troop the flexibility to launch attacks against Al-Shabaab.